Rainbow Riches slots game is a favorite of many players. Similar to books and movies, it’s hard to make a good sequel. This is the reason why many players want to see if Rainbow Riches Pick n’ Mix slots game is any better than the original. Also released by Barcrest, this sequel shares the same theme that features elements of Irish lore, including leprechauns, rainbows, and pots of gold. Similar to Rainbow Riches slots, this game has 20 pay lines and five reels. The difference is the Rainbow Riches Pick n’ Mix slots game uses fixed pay lines. At least, you are always maximizing your winning potential in this game. It also includes extra features like the Big Bet game. It also offers some familiar bonus games and brand-new ones. If you play Rainbow Riches slots, you’ll enjoy Rainbow Riches Pick n’ Mix slots. Before the game starts, you can choose a bonus and it will appear more often. You can pick from five bonus symbols on the reels. At any time, you can change the bonus you want by picking the “bonus reset” button. The active bonus you chose will appear on the reels. But there’s a catch: the bonus you didn’t choose won’t be active for this round. If you love playing high-risk games, you’ll enjoy the Big Bet game. You can get started in this game through the purple button above the green spin button. Meanwhile, if you get four scattered symbols, the bonus you get will turn into a super bonus. If you get five of these symbols, you’ll get a prize of 500x your line bet instead of the bonus game. 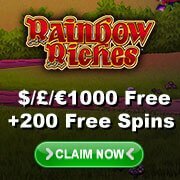 If you miss Rainbow Riches slots free spins, Rainbow Riches Pick n’ Mix slots can still provide it. You can get up to 30 free spins with the free spins bonus. You can also try to win the Big Bet game. If you win, you get 3x your chosen bonus. However, you will have to settle for five free spins if you lose. Rainbow Riches Pick n’ Mix slots is an enjoyable sequel to an already great game. Not only will you get more bonus games, you will also have the chance to pick one bonus to appear on the reels.